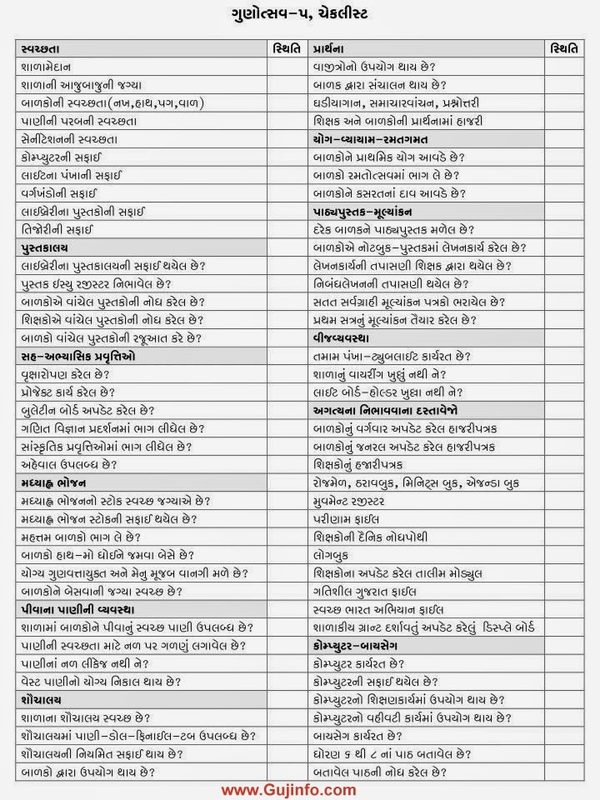 Gujarat Government Education Department Dhwara Aagami date 20,21 & 22 November Na Roj Aayojit Gunotsav 5 Ma Kai Vastu Dhyan Ma Levi Jaruri Chhe Tenu check List Ahiya Mukvama Aavel Chhe. Jema Svachchhta, Pustakalaya, MDM, Water, Shauchalay, Prarthna, Yog-yogasan, Vij Vyavastha and Any Dastavejo Vishe Ni Sthiti Jovama Aavshe. Download and share with all primary Teachers.